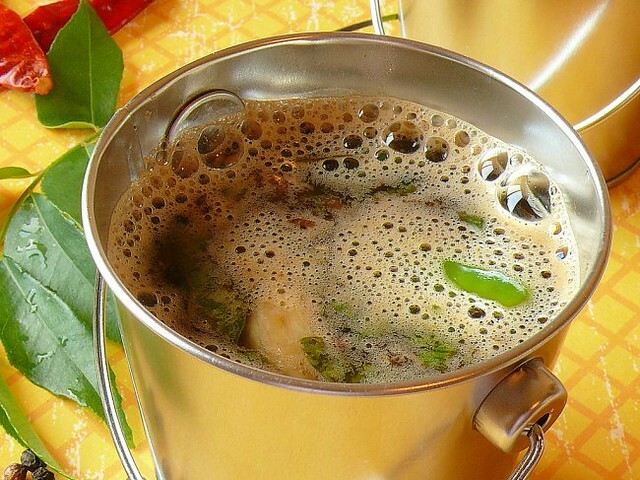 This particular Rasam recipe takes its basic elements from South Indian cuisine and uses the vital ingredient “Tamarind” which is used in a vast amount of Tamil dishes. When coupled with hot spicy Rasam Powder and fresh ingredients, its taste is utterly divine. In a traditional South Indian meal, Rasam follows the Sambar and followed by Curd. Called by different names as Rasam in Tamil, Saaru in Kannada, Chaaru in Telugu, Rasam is more like a soup which improves digestion, relieves colds, sore throats, loss of appetite and lots more. At Amma`s place, our meal on most days consisted of Sambar or Kuzhambu, Rasam, Thayir/Yogurt with Vegetables stir fry. Rasam was a must even if others were not made. Appa was very particular about having rasam everyday and it was prepared fresh each day. He relishes the rasam Amma makes and always said we sisters never came close to her. Today`s recipe is the regular Rasam amma made on most days, although she made different varieties like Lemon Rasam, Mysore Rasam, Pineapple Rasam and Pudina Rasam to name a few. Soak the tamarind in water and extract the pulp. Cook the tomato, when cool peel the skin and set aside. Combine the tamarind extract, paruppu thani//diluted dhal water, garlic, green chillies, cilantro, curry leaves, tomato and salt to taste. Gently squeeze with your hands the ingredients to combine well and to bring the flavors of the fresh ingredients. Add the Rasam powder and mix well. 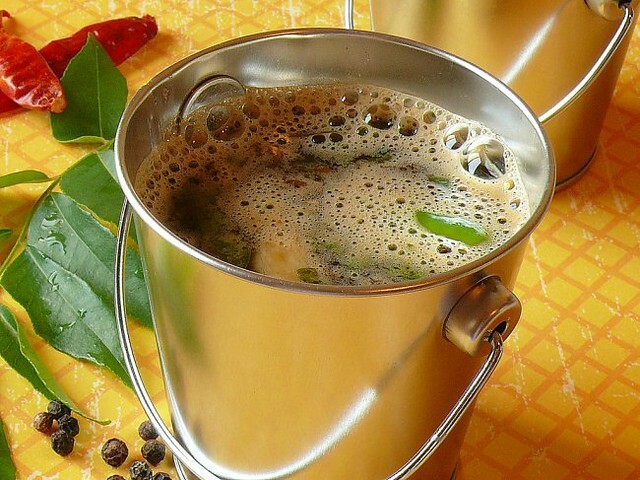 Bring this rasam to a boil in in a kadai which can hold the prepared rasam. Remove from fire just when it starts to boil. Heat a teaspoon of oil, season with mustard, cumin, fenugreek and asafoetida. Add the seasoning to the rasam. Serve with rice or have it as a soup to relieve cold and congestion. TIPS: I normally cook about a 1/2 cup of Toor dhal with 1/4 teaspoon turmeric powder for Sambar and when cooked, I add about 4 cups of water to the dhal. The dhal settles down leaving a clear soup on top. I then use the clear soup to make Rasam. I cook the tomato separately along with the dhal in the pressure cooker. When cool, remove the skin and use for Rasam. A nice gentle squeeze of the ingredients is a must to get a nice flavorful Rasam (this is where, lies the secret to Amma`s rasam~there is some magic in her hands I guess). Seasoning at the end is optional. You can season in a kadai and then add the combined rasam and bring to a boil. Amma insisted seasoning at the end. Follow the recipe for rasam powder here. 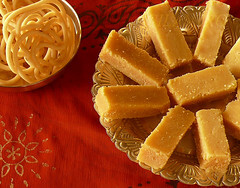 I love rasaoms but hardly make them . Wish i had that bicket ;-) slurp. Love the Bucket Very Much! When you posted Rasam powder recipe, was wondering where is the rasam pic. Now the pic will make me to try ur Rasam Powder! 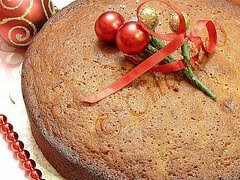 All time fav and comforting recipe. Awesome photography and looks like a pro. I can feel poondu rasam in my house. The photos look yum. Lovely clicks dear. I love rasam. Delicious!! I love rasam - it is so tasty and healthy. rasam looks yummy..if have rice and poriyal what a delicious meal it would be..
i always prefer to prepare it because it really good for digestion and also taste too good with any other combos.. I made this exact Rasam a few days ago and saved that extra rasam powder in a bottle. That looks absolutely gorgeous - our simple rasam photographed beautifully. Love the post. Keem em coming! First time here . i'm totally in love with ur lovely well lit clicks ... The recipes are amazing too . I'm drooling over the spicy tangy rasam !!! The presentation looks so traditional and makes me crave for it. I love that little bucket!! You won't believe it but I love my rasam cold, like a cold soup ;-) Looks so appetizing. Love the cute bucket...fabulous rasam prep!! Rasam is one item that is their in my daily menu...Though used to make it in slightly diff way...Loved the Awesome Clicks !! Though it is fun to drink this wonderful lentil and tomato soup it has many cures...a soar throat is the best if I want to site and example. I am sorry I missed it and I have corrected it now. Thank you.